Senator Fraser Anning says the mother of a teenage boy who broke an egg on his head should have slapped her son around a long time ago. 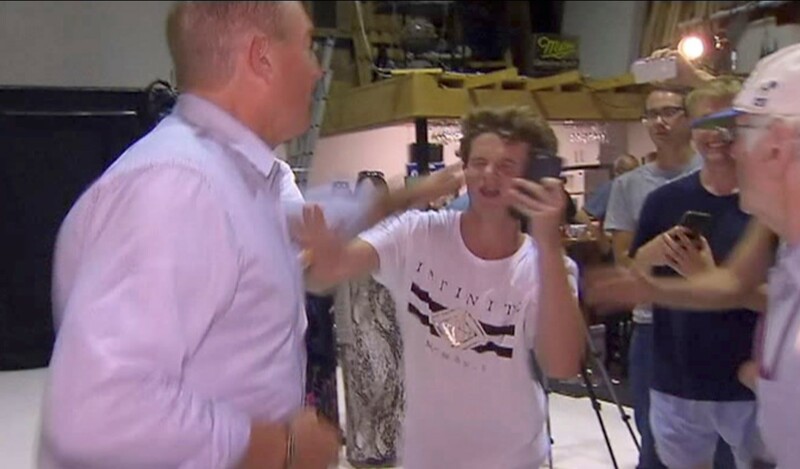 The Queensland federal MP also said he was acting in self-defence when he struck the Melbourne boy who'd just cracked the egg on the back of his head during a press conference on Saturday. "It's all okay for politicians who live behind their high fences, they don't have to rub shoulders with these people, but (it is) the people in the street who are being attacked," he told reporters in Brisbane on Monday. Home Affairs Minister Peter Dutton has urged voters to dump Senator Anning, who's been branded a disgrace for his comments on the Christchurch terror attack. The Morrison government and the opposition have rejected calls from the Greens to change laws to allow politicians to be expelled from federal parliament. Mr Dutton said voters would be able to react to Senator Anning's "appalling" comments at the May election. The government and Labor will move a censure motion condemning Senator Anning's comments when parliament returns next month. Former prime minister Tony Abbott believes Senator Anning will be booted out of parliament at the election. "It was a lunatic thing to say and he deserves censure, he absolutely deserves censure and I'm sure that's what he's going to get from the parliament when we go back," Mr Abbott told 2GB. Senator Anning replaced One Nation's disqualified Malcolm Roberts in 2017 but quit the party to sit as an independent after a falling out with Pauline Hanson. The One Nation leader says she will abstain from voting to censure Senator Anning because it won't "prove a damn thing". A censure motion is one of the stronger forms of rebuke parliament can make. But Greens leader Richard Di Natale wants the parliament to go further, saying his party is exploring all options including changing the Privileges Act to allow politicians to be expelled. Prime Minister Scott Morrison said Senator Anning should face the full force of the law after he reacted violently to a teenage boy who cracked an egg on the back of his head. NZ Prime Minister Jacinda Ardern said the senator's comments were a disgrace. Australian man Brenton Tarrant, 28, from Grafton in NSW, has been charged with one count of murder over the shooting in Christchurch, which resulted in the deaths of 50 people.